The award-winning MRI scheduling project was presented by: Chris Weisbrod, Lean Six Sigma project leader, Carol Arteno, radiology informatics manager, and Michael Rubin, MD, chairman of the radiology department. In just a few short years, the Akron Children’s Hospital lean initiatives are rising to the top and earning recognition from the international Lean Six Sigma community. A team from Akron Children’s competed against international organizations in the “Best Process Improvement Project Under 90 Days” category and received an honorary mention award at the International Quality and Productivity Center’s Lean Six Sigma and Process Improvement Summit in Orlando, Fla. They presented a case study detailing a Lean Six Sigma performance improvement project in the radiology department held in August 2009. The Center for Operations Excellence facilitated the two-day Kaizen event, which brought together radiologists, technicians, schedulers and Authorization and Registration Center staff members to brainstorm ideas and implement solutions. 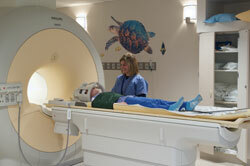 The dramatic results reduced MRI scheduling wait times by maximizing use of the hospital’s MRI units. Some of the problems tackled by the team included figuring out how to develop a more predictable schedule, reduce cancellations and no-shows and improve the authorization process to have a supply of patients ready to fill open time slots. Before the Kaizen, the hospital was doing about 86 MRIs per week; now, the average is 112. The wait time to schedule a sedation procedure dropped from six-to-eight weeks to 10 days, while the wait time for non-sedation procedures dropped from 25 days to less than three. The end result is a more efficient use of resources for the radiology department, quicker wait times for patients needing appointments, faster turnaround on test results for physicians and additional revenue for the hospital – a win for everyone involved. On top of the benefits already realized, the award from the IQPC Conference is just icing on the cake.